It has been a long time since I have written a post. I'm not sure if anyone ever even read the few posts that I had. I have been thinking a lot and think I am ready to give this thing another shot... This time I want to write about something a little different. I want to talk about how a goal I set for myself and how I took a few steps back. I started to run a lot in this past year. I mean the new trend going around is being "healthy and fit" right? So I thought I would jump on the bandwagon as well. It was just 3 short years ago I ran my first ever race, and it was a 10k at that. My family for the past 12 years has been running the Peachtree Road Race in Atlanta, I was usually on the sidelines eating Krispy Kreme while everyone was racing past me. Three years ago my mom asked me if I would run with the fam that year. With lots of convincing I said yes, so there I was running my first ever race. It was not easy and very discouraging. It wasn't until this year that I really found joy in running and exercising. If it wasn't for my mom I probably would still be living the unhealthy lifestyle I did just 2 years ago. I have gone through slumps and some bad months. I signed up for my first mud run at the beginning of the year. Something I thought I would never do, a few months later I did my second one. With two mud run's, three Peachtree Road Races, and multiple 5k's under my belt I felt like I was on top of my running game. My mom is a runner herself, a legit runner at that! So she has done a few marathons in Disney World (our favorite place on earth), so I decided I was ready to take on my first half marathon... What better way to do it then in Disney World dressing up as a princess? October 1st I started my training and I was doing great! running the 3 times a week I was suppose to, eating great, and better yet feeling great! I was so excited I was actually maybe going to be able to keep up with my mom. Well November 10th happened... I had an incident happened that put me in a depression for a month and a half. I stopped running and working out altogether, stopped worrying about what I was eating. Ultimately stopped caring about anything and everything and just watched the days go by until my half marathon. I would try to run a little and felt so defeated, I felt like a failure. I felt like giving up.. which I did.. Until yesterday. I started to realize that ready or not the race is on it's way. 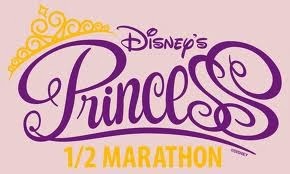 So I started googling blogs about the Princess Half Marathon so I could read up to get some motivation. I thought if I could get it in my head about how much fun I will have that maybe I can actually be somewhat ready by the time February 23 comes around. So I thought I would take this opportunity to share my training up until the race. I needed something to keep me motivated and if I am going to run this race Feb 2014. Even if one person reads this and get's something from this that is enough for me. I ran 7 miles this weekend... One mile closer to my 13.1. I'm still far away from my 13.1 but it's in reach now and it's time I stop feeling bad for myself and start putting positive thoughts in my head again.